The E-Z Lube System makes maintaining your motors lower unit fast and easy. 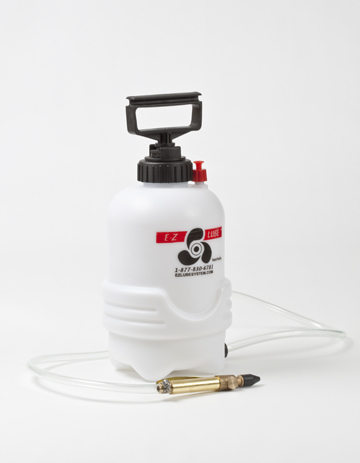 The large capacity lightweight container (1 gallon) features a filtered brass valve that releases pressurized gear lube into the lower unit through a universal rubber nozzle. A sleeve around the heavy-duty pump isolates the diaphragm and directs the pressure into the container at the top — preventing any aerating of the lube. The see-through container shows the liquid level in one quart increments and a pressure relief valve makes it safe and convenient to release pressure before refilling or storing.